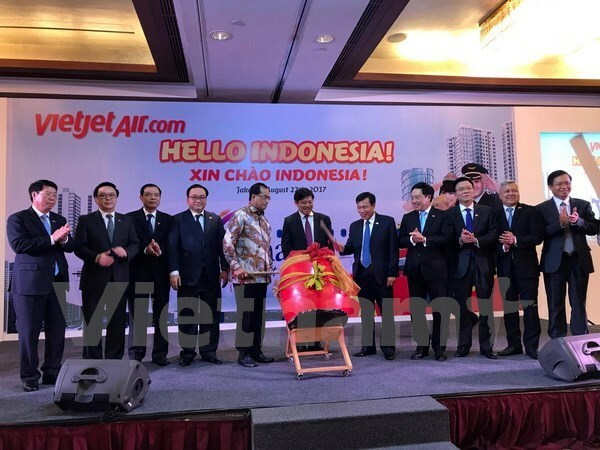 Jakarta (VNA) – The budget carrier Vietjet announced the direct flight connecting Indonesia’s Jakarta with Vietnam’s Ho Chi Minh City during a ceremony in Jakarta on August 22. Attending the event were Deputy Prime Minister and Foreign Minister Pham Binh Minh, Secretary of the Hanoi municipal Party Committee Hoang Trung Hai, and senior officials from the two countries. The daily new service, which will last nearly three hours from December 20, is expected to facilitate travelling and trade between the two countries. It will depart from Ho Chi Minh City at 8:40pm and arrive in Jakarta at 11:40pm. On return, it will leave the Indonesian city at 1:40am and land in Ho Chi Minh City at 4:40am.